As promised about 100 years ago (see: FIELDS, positive visions for the future), here’s another post about Fields – patterns of social, scientific, and technological transformations, an exhibition featuring works by artists who adopt an engaged, critical and active role in society. This time, i’d like to focus particularly an installation which explores the life of a very common, yet mysterious, snail that travels around north west Europe. Possibly on the feet of ducks which i find most romantic. This Wandering Snail is the radix balthica. The reason why we should all get a bit more excited about those little creatures is that they can survive in extreme and varied environmental conditions and constitute thus an excellent model for determining the traits which species might possess that could be beneficial for survival under altered environmental conditions, such as climate warming and increased saline intrusion into freshwaters. The installation is an improvised rigging of laboratory vessels and technology developed with support from laboratory technicians skilled in researching and constructing various laboratory setups. 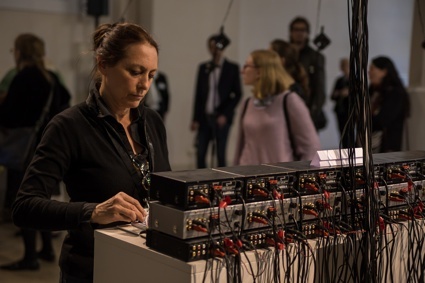 The application of data (lab and field) has been developed through the work – investigating the control of lighting, sonification and physical vibration of elements in the installation. One aspect of the data explored is the connection of the name “Radix balthica”, the snail, and “Radix Sort” a computer science based sorting algorithm. We are interested in the interplay between a snail (a messy biological entity under scientific observation and the subject of experimentation) and an algorithm (dating back to 1887 and the development of tabulating machines) that sorts and orders data sets..
Why did you decide to work with the Radix balthica? What makes it more interesting than other types of snails? From the scientific perspective Radix balthica is a species of aquatic snail that exhibits a high degree of plasticity – i.e. its shell form, pigmentation, physiology and development are all known to change in response to environmental conditions. This plasticity is thought to be the reason that it is widespread, occupying a range of different habitats in Northwest Europe, from small temporary ponds to large rivers and lakes and the Baltic Sea. The fact that this species has such a high level of tolerance and exhibits a lot of variation in its development, physiology and form makes it an excellent model species for studying questions to do with evolution – as variation is seen as the ‘raw material’ on which natural selection can act. Moreover, it will also give clues as to the way that freshwater organisms might respond to climate change, i.e. increased temperatures and saline intrusion into fresh waters through sea level rise. Research into the evolutionary ecology of this species at Plymouth has focused in on its developmental biology. Because it has transparent embryos its development can be observed easily in the laboratory and it also reproduces readily in the laboratory, allowing studies of inheritance. Most recently, there have been advances in the generation of ‘new generation’ genomic resources for this species that will allow the investigation of how genetic and environmental factors interact in its evolution and ecology. From the art perspective our interest in Radix balthica has grown over a three year collaboration with Simon Rundle (freshwater ecologist) and involvement in his research. We are intrigued by how a tiny grey snail that is easily overlooked and seemingly insignificant, has come to play an important role as a marker of climate change. We are interested in our human relationship to this creature. We were drawn to the idea that this species had been named the ‘wandering snail’, a name that alludes to its widespread distribution but could also be seen to relate to the ambiguity associated with its scientific names, which have shown numerous changes since its original naming by the father of classification Linnaeus. This aspect of the snail’s biology were included in the work through the text from Linnaeus’s journey to the island of Gotland in the Baltic Sea in 1741, on which he collected the type specimen of Radix balthica. 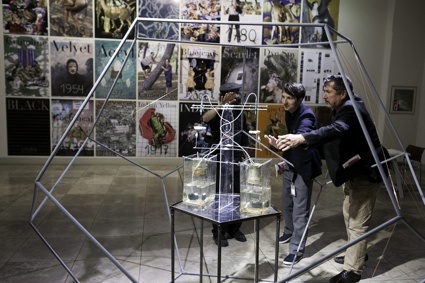 We felt that working with the snail in the context of the Fields exhibition in Riga would be very appropriate in relation to location and migration as well as transdisciplinary research brought into the public domain. Could you explain the installation? I actually couldn’t see the snails when i was in the gallery, i guess they were hiding. There are two main strands to the work that draw on the idea of wandering. The first relates to the tolerance of the species. There are three ‘replicate’ jars containing snails and pond weed in water of three salinities from three locations where Radix balthica can be found: i) rivers near Plymouth – the place where the snails in the exhibition were collected from; ii) the Baltic Sea at Riga; and iii) further south in the Baltic Sea, where the salinity is higher. A further, single jar sits on the shelf above each of the three replicates for each treatment. This jar contains water of the same salinity as the corresponding three jars. This jar ‘controls’ the light intensity in the corresponding jars by converting salinity sensor readings into values for LEDs. This form of control reinterprets the common use of the term of ‘control’ in scientific experiments – replacing the idea of a ‘reference’ treatment against which experimental responses can be gauged with a more literal interpretation of control. The second strand of the work draws on the ambiguity of the naming of the species since Linnaeus. We provide three readings of Linnaeus’s original text describing his journey to Gotland on which he collected the type specimen of Radix balthica – the original text and in two versions sorted by the Radix algorithm. When it comes to perceiving them they are the humble snail – an often overlooked species, difficult to see and with the work we invite you to spend time looking and watching. But i saw glass containers, wires, plants. What are they? What is their purpose? How do they work together? The glass containers are setup in three groups representing Plymouth, Baltic and Riga. Each set has three jars with water, plant, snails and a measured salinity inside that are lit from above using white LED light. The fourth jar in each set has the same measured salinity as the three jars below it and a salinity sensor. 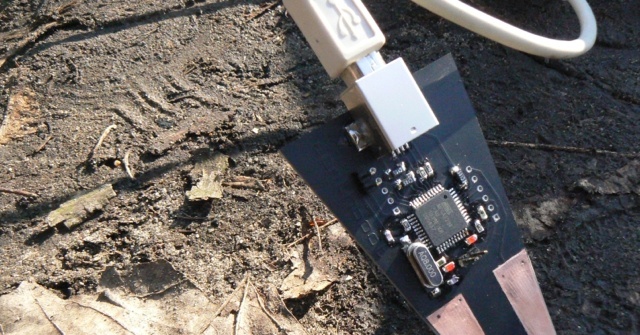 The salinity sensor in each group is measured using Arduino to control the intensity of the LEDs. The code also introduces the changes in the system over time – a six-hour fluctuation in line with tidal movements that would alter the amount of salinity present in the water. 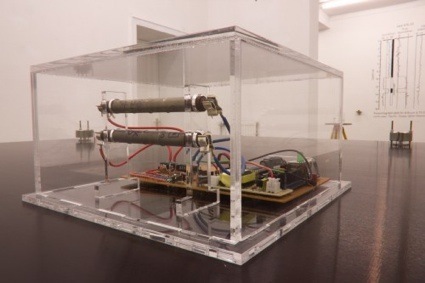 The wiring shows the mapping of these connections throughout the system and also includes the surface transducer that is placed on the top shelf from which the audio plays out across the architecture of the installation. The plant inside the jars is Canadian Pond Weed (Elodea canadensis) that is part of the small ecosystem where the snails feed off the algae that grows on the plant – sustaining both the snails and the plant. During the course of the exhibition, you are monitoring the way the snails respond to gallery conditions, light, salinity and atmosphere. What have you discovered so far? Such a long exhibition provides challenges to keeping the snails healthy and alive especially at a distance: we don’t quite know how they will fare and so – in this sense – it is a real experiment, taking lab snails back into the field which is, in this instance, a public art field. We have set up some test conditions and are monitoring the liveliness of the creatures through observation by colleagues. In mid June Professor Richard Thompson (a member of Marine Biology and Ecology Research Centre, Plymouth) visited the gallery and re-photographed the snails using Simon’s original viewpoint. One of us will go across to Riga to repeat this process in a couple of weeks. 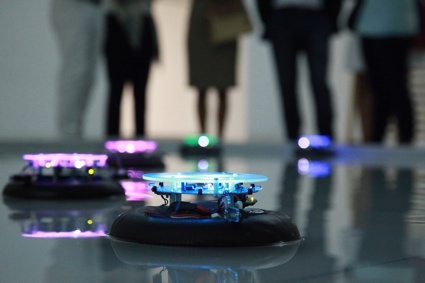 Why do you want to monitor the response of the snails to their long sojourn in the gallery? At the outset of the project we wanted to monitor the fate of the snails for a couple of reasons. We wanted to know how the snails would respond to an art environment, and how their fate might shape in accord with our artistic intent. Beyond this we envisaged that the act of ‘monitoring’ might act as a strategy around the instability of the gaze (moving between aesthetic/scientific) in relation to a gallery context. We worked with the idea that scientific visualisations are premised on a relational positions of power between those who are scientifically educated and those who are not. We wanted to extend an invitation to the gallery viewer to participate in (but not be educated by) the scientific gaze . We have set up what appears to be a scientific experiment in a gallery. The approach was to use a strategy of mimicry where the art exhibition context is deployed as a means to identify fissures within an experimental system that can then be opened to further reflective artistic investigation. The description of the work also mentions the Radix Sort algorithm. What kind of role does this algorithm play in the installation? Radix Sort is a sorting algorithm that is a playful mediation between the human and the snail. The initial connection came through the name ‘Radix’ as the root or base in computing and in the naming of a species and this connection developed further after researching the way Radix Sort uses two categories to sort data: Least Significant Digit (LSD) and Most Significant Digit (MSD). The use of the LSD method brings up ideas around noise in information that, which parallels other areas of research within the Radix group. The algorithm is used within the work to play with the text and form a sonic output that is both a reading of sorted text (lexicographically) and a further manipulation of the audio file of that reading. Two readings of the text about Linnaeus’ journey to Gotland, on which he discovered the species were recorded – one is a straight recording and another made after the algorithm has sorted the text alphabetically. The audio files are also sorted using Radix Sort by frequency and amplitude and the results are then mixed with the readings and played out across the architecture of the installation shelving using a surface transducer. You work together under the name of radix research group at the University of Plymouth. What brought you together? Is there a website that gathers all the works you’ve done together? A shared interest in interdisciplinary art/science research through practice brought us together. Three of us – Deborah, Simon and David – are academics at Plymouth University and we have worked together on precedent projects involving the snail since 2011 when Deborah became artist in residence with MBERC (Marine Biology and Ecology Research Centre) at Plymouth and created a collaborative work called Transpositions with Simon. David then worked with both on a second project, an immersive sound installation based on the snail embryo, called ATRIA. Bronac Ferran is a writer and curator who we invited to collaborate with us to build new audiences for the work. Radix as a shared art organism is relatively new. We’re building a website and will hopefully do some publishing in future as well as more exhibitions based on the humble snail. essay by Simon, and a video of Radix balthica’s full embryonic development by Oliver Tills, MBERC, Plymouth. Website (under construction) about Radix. Do check out Wandering Snail at the Fields exhibition, produced by RIXC and curated by Raitis Smits, Rasa Smite and Armin Medosch. The show remains open at Arsenals Exhibition Hall of the Latvian National Arts Museum (LNAM) in Riga until August 3, 2014. Previously: FIELDS, positive visions for the future.